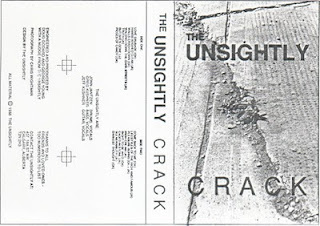 This chapter of the Kushner Brothers' exploits ends with this, our third Unsightly tape. Greg tells us that this was again recorded at CJSW, this time in a temporary studio set up at CJSW during the transition from the old production studio to the new (regardless of how old or new they were, they were both in the basement, unlike the palatial space they now occupy). This tape was recorded after Jonn Janzen took a break to do some travel. Jonn would leave again in the summer of 1989, and the Unsightly called it a day. This tape contains earlier versions of two of our Zoo Story favourites, "Pieces of Candy" and "Love Crusade." These guys were big into re-recording songs - Greg tells us that he and Jeff re-recorded "Crack" in its entirety in 1996, "for a lark." That's one hell of a lark.